Dubai: The Hellenic Business Council was formed this year in response to the steadily growing Greek business community in Dubai. 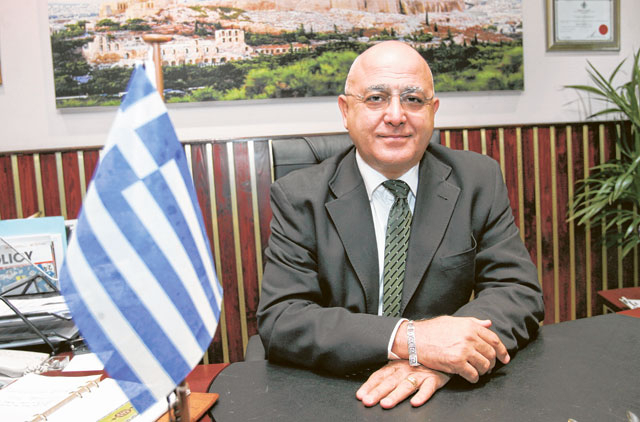 Council chairman Petros Kallidis talks about the growing opportunities in the community and what can be done to improve trade relations. GULF NEWS: How big is the Greek community in Dubai? Petros Kallidis: It is difficult to quantify as there is no mandatory registration available, however we believe there are over 140 companies of Greek interests. Overall we estimate there are some 3,000 Greek nationals working in the Emirates. While we do not have statistical data on the growth of the community, we note figures of 1,000 Greek nationals were being quoted in reports from the Ministry of Foreign Affairs in 2007 so we estimate a compound annual growth rate of 30 per cent for Greeks living and working in the UAE. What industries does the UAE based Greek community work in? The traditional industry sectors that Greek companies have been servicing for the past half century or so in the Emirates have been construction, shipping (including chandlery, agency, supplies, ship repairs, bunkering, management, ship broking etc) and trade, predominantly in construction, olive oil, pasta and tomato products. Another very important sector is the fur trade where traditional skills from the north of Greece are being imported for re-export, mainly to the countries of the former USSR. More recently (in the last five years) there has been an expansion into service sectors with companies in the health, IT, exhibition (especially since the 2004 Athens Olympics), logistics, executive recruitment and insurance. In addition there has been a noticeable increase in legal banking, consultancy and finance. What kind of services do you offer to help the UAE-based Greek business community? The Hellenic Business Council was officially created in October of last year as a private initiative by Greek business people and professionals with the prime objective to support the Greek businesses and professionals who are based in Dubai and northern emirates. We're trying to create awareness in the local community that Greece is a good market where you can invest in the tourism industry, in the shipping industry, in real estate and you would expect flexibility on the tax laws. The government is revising all its laws to encourage foreign investment. We are also creating incentives for Greeks to look for opportunities in the UAE. We have people working in real estate promoting UAE properties in Greece. We see more people doing feasibility studies in regard to what type of investment can be done in the UAE. What is the current situation in regard to trade between Greece and the UAE? Diplomatic relations between our two countries date back to the formal recognition of the UAE in 1971, the opening of our embassy in Abu Dhabi in 1989 and with the UAE opening their embassy in Athens in 2009. The Athens Chamber of Commerce and Industry signed a Memorandum of Cooperation with its equivalent in Dubai in 2006 during an official visit of Greek President Karolos Papulias which followed a similar agreement between the Hellenic Federation of Enterprises and the Abu Dhabi Chamber of Commerce earlier that year. Our two countries signed a double taxation treaty in January of 2010 during the Greek President's official visit to Abu Dhabi. The treaty is set to boost bilateral economic relations and also provides a range of tax breaks for the UAE government and private investment in Greece. These include zero tax on income generated by real estate and up to 95 per cent tax exemption on benefits of shares and 100 per exemption for air transport operations. Greek exports to the UAE in the previous January to November 2010 increased by 27 per cent compared to a similar period in 2009. This contrasts to a 37 per cent drop in 2009 from the peak of €217 million in 2008. What is the main trade product between the two countries? The ten products that comprise 70 per cent of Greek exports to the UAE are: furs, fuel additives, telecommunications equipment, aluminium products, marble, resins, tinned fruit, cosmetics, fish and ready made garments. How has the recent economic situation in Greece affected the business community here? The global financial crisis has had an impact on the bilateral trade between the UAE and Greece. The year 2009 saw a 38 per cent decrease in exports to the UAE. This has affected retails sales of luxury goods with the proportionally significant effect on the fur trade as well as sales of telecommunication equipment and generally construction materials all of which form the bulk of Greek exports to the UAE. This situation has been exacerbated by the relatively high production costs in the Eurozone as compared to competitive markets in the Far East and sub-continent and disruptions in exports due to industrial unrest last year. Additionally Greek businesses are facing considerable challenges with credit control with credit periods stretching and cash flows negatively impacted. What are the main challenges the Greek community face working in the UAE? Whilst the Greek shipping community in the northern emirates has tended to be more close knit and organised ever since the demise of Greek labour in the Greek and Cypriot construction companies in the early part of this decade, it has been challenging for the community to interact and communicate with each other. The Hellenic Business Council is a recent addition and currently numbers over 100 members. Additionally there has been an informal social group, Emirates Greeks which was formed in 2003 and numbers some 500 participants. Clearly these groups are only reaching a small minority of the estimated population in the Emirates and the challenge is to raise awareness of these organizations and the benefits it can bring to the community. Another challenge is the absence of a Greek consulate in Dubai which necessitates a visit to Abu Dhabi in order to carry out transactions such as passport renewals, marriage/birth registrations etc, which can result in the loss of a whole business day.